Cleco Pneumatic 64 Series Trigger Start Reversible Stall Pistol Swingbar Nutrunners feature a trigger start ignition, a sliding knob reverse, and a swingbar. 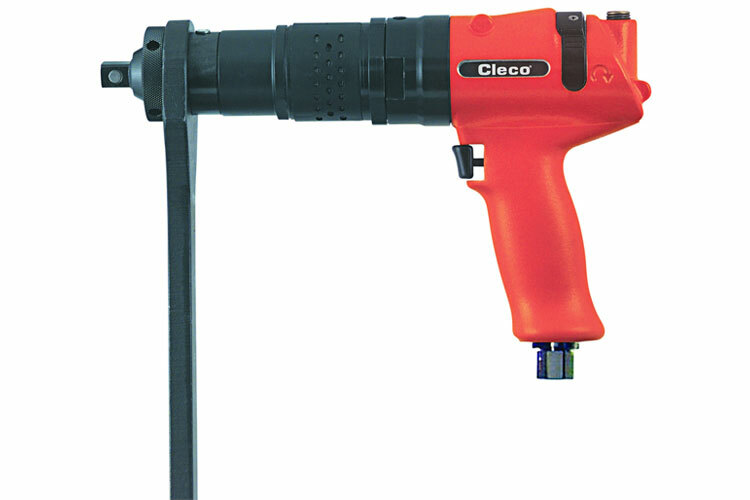 Cleco Pneumatic 64 Series Trigger Start Reversible Stall Pistol Swingbar Nutrunners feature a high power-to-weight ratio and slim profile nose that delivers more torque to hard-to-reach joints. Cleco Pneumatic 64 Series Trigger Start Reversible Stall Pistol Swingbar Nutrunners feature heavy-duty gearing that is designed to withstand high torque output. The durable sliding reversing valve on the Cleco Pneumatic 64 Series Trigger Start Reversible Stall Pistol Swingbar Nutrunners is conveniently located at the rear of the housing. Cleco Pneumatic 64 Series Trigger Start Reversible Stall Pistol Swingbar Nutrunners also feature an ergonomic soft-touch handle. The 64TTS205D6 Cleco Pneumatic 64 Series Trigger Start Reversible Stall Pistol Swingbar Nutrunners, 3/4'' Square Drive is one of thousands of quality tooling products available from MRO Tools. Please browse Cleco Pneumatic 64 Series Trigger Start Reversible Stall Pistol Swingbar Nutrunners for tools similar to the 64TTS205D6 Cleco Pneumatic 64 Series Trigger Start Reversible Stall Pistol Swingbar Nutrunners, 3/4'' Square Drive. 64TTS205D6 Cleco Pneumatic 64 Series Trigger Start Reversible Stall Pistol Swingbar Nutrunners, 3/4'' Square Drive description summary: Cleco Pneumatic 64 Series Trigger Start Reversible Stall Pistol Swingbar Nutrunners Square Drive: 3/4'' Torque Range: 113-151ft-lbs / 154-205Nm Free Speed (rpm): 115 Overall Length: 12.5'' / 316.5mm Weight: 8.2lbs / 3.7kg Air Inlet NPT: 3/8'' Quantity discounts may be available for the 64TTS205D6 Cleco Pneumatic 64 Series Trigger Start Reversible Stall Pistol Swingbar Nutrunners, 3/4'' Square Drive. Please contact MRO Tools for details.